A change of scenery benefits everyone, and that includes your pets. Unfortunately, your pet may fear the change from routine that goes along with traveling the open road. What can you do to make the journey pleasant for all of you? 1. BYOCC. Bring your own creature comforts. Carriers provide a comfortable, safe way for your pet to travel. The surrounding crate feels familiar to your dog or cat. Tuck in a favorite toy or pillow for a little reassurance. 2. Test drive. 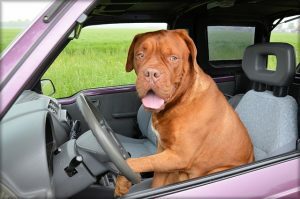 Before you drive across the country, try a short trip or two first to help your pet become accustomed to travel by car. 3. No pet left behind. Wherever you wander, don’t leave your pet in a parked car. You would be astounded by how quickly temperatures inside a parked car can rise, putting your pet in danger of overheating. 4. Daily breads, meds, and leads. You know what your pet needs on a daily basis – pack all medications, special foods, and favorite toys. Don’t forget your dog’s lead, and a small first aid kit to help you handle an emergency. 5. Don’t sweat the small stuff. If your pet exhibits symptoms of stress, you might consider Adaptil, available in collars, diffusers or sprays. Pheromones are hormones released by lactating mammals to comfort and soothe puppies. They work well to soothe a harried traveler like your pet and are available at Town N Country. 6. A way home. A microchip can help ensure your pet’s returned to you should the unthinkable happen and you’re separated. Also ensure that tags are up to date. 7. Traveling tummies. Nothing’s more miserable that an upset stomach on the road. Prevent potential problems by offering bottled water only once your journey’s begun. You may want to talk to your vet about Cerenia, a medicine for motion sickness. 8. A lighter fare. Give your pet a light meal three to four hours prior to your departure. Even on a longer trip, don’t feed your pet in a moving vehicle. 9. Shot records. Bringing along a copy of vaccination records (maybe on your smart phone) is a prudent idea. While you hope to never have to pull them out, it’s always better to be safe than sorry. Before you go, make a pit stop at Town N Country. You can make sure all immunizations are up to date and talk to us about any medications your pet may need to travel before you start your journey.